As a jewellery designer/maker I would say "you can never have enough beads", but when I am sitting looking at all my beads surrounding me Wow! yes you certainly can have to many beads. 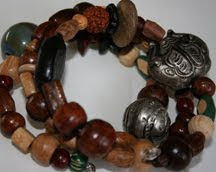 At the moment I am really drawn to earthy looking and wooden beads. I made two of these bracelets and decided to keep one myself because I felt really attached to it. The 2nd one also went straight away as w ell - to guess who - my cousin Susan. It is amazing how two people who are very different are also very much alike. How lovely! That was so sweet of you to give one of your beautiful bracelets to your cousin! You have a huge heart Davine! They're both lovely but the second one is my favorite. I can visualize it jangling on my wrist. That's so true about getting drawn to certain types of beads, the same thing that you have experienced happens to me -- I will get very interested in different styles of beads...for awhile I was buying nothing but matte faceted Czech beads -- crazy for them -- and then I started getting interested in top-drilled vintage long teardrops -- bought them wildly -- and now it's on to something else, vintage Swarovski "freshwater" glass pearls...!!! I love your ability to combine the beads. That's why I stick to just earrings -- I just don't have that wonderful ability you do to put together so many different beads into a cohesive "whole." You do beautiful work. These colors and textures are stunning. 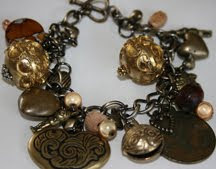 Love your current attraction to the earthy tones, Davine ... the new bracelets are just gorgeous.